Who would have believed that two donated organs would power the efforts that, guided by the survivor’s personal Christian faith, living on inside a registered blind man, could help two per cent of the East Renfrewshire population? East Renfrewshire Good Causes (ERGC) has now breached the incredible milestone of having helped more than 2000 individuals. In the past six months alone, ERGC has helped 139 individuals. A recent round-up of such good deeds includes helping a single parent obtain a push chair buggy, working with Jewish Care Scotland to replace a broken cooker, two new mattreses for young children, delivering groceries and toiletries to Overlee House, clothing for a vulnerable adult and so much more. Russell Macmillan was just 23 years old when he completely lost his sight after being diagnosed with type one diabetes on his eighth birthday. He received a life-saving double transplant in January 2007. And to date, those two organs have helped thousands of people across East Renfrewshire. Russell said: “I’m only alive today thanks to the transplanted organs, and I really wanted to give something back, to honour the memory of my donor. East Renfrewshire has a population of 90,000 and to think that we have helped two per cent of that. “In the last 11 years of relative austerity, and with growing demand due to ageing population, our area needs the unique ERGC model to raise local standard. “ERGC in layman’s terms is best described as a “good neighbour club” as we look to give a helping hand to deserving neighbours to show we care about our community. “We offer to help rich and poor to show we care. “Pulling all sectors of our society together from individuals, businesses, community groups/clubs/churches/charities, both social and printed media to work to help fund and provide the unmet local needs as identified by trained frontline professionals, from teachers, police, health, social and housing workers. 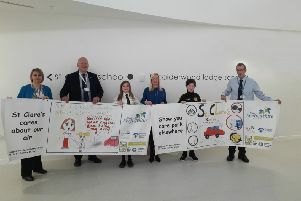 Russell continued: “I’d like to thank all the dedicated, trained frontline staff from health and social care homless team, teachers and all the other staff who make East Renfrewshire Good Causes aware of the varying needs within our community. “Without that expert knowledge, our business supporters would not be able to target our resources to those in need. For more information on ERGoodCauses, contact Russell Macmillan via East Renfrewshire Good Causes , email info@ergoodcauses.co.uk or call 0141 639 8230 or mobile 07714293256. A fundraiser for ERGC will take place this Saturday (October 6) at the Whitecraigs Tennis and Sports Club, from 7.30pm-late. Tickets are £10 each. Local musician and club member at Whitecraigs, David Killin has organised more than seven local bands to play for free o raise funds for East Renfrewshire Good Causes. The music will be mainstream, well- known songs that guests will recognise. So why not come along and join the fun evening with music and a raffle, and do your bit for our community?